Every house needs a pretty entrance light I think. 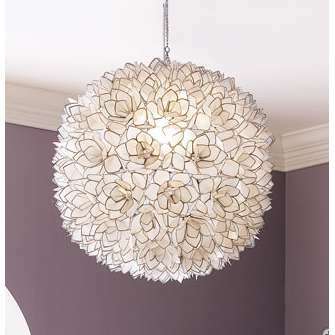 In our last house we just had standard height ceilings which makes it very difficult to have anything hanging so we had a simple oyster light with a pretty pattern on it. I quite liked it at the time but it certainly was going to win no design awards. This time we are lucky enough to have 3m high ceilings and can have something a little more special. We have purchased the most gorgeous Capiz or lotus flower pendant and we think at this stage it will go in the entrance. I say we think because it is rather larger in person than what I was expecting. The husband and I argued back and forth over it being too large so when we finally deboxed it to settle the argument we drove it out to the house when it was still at frame stage and mock hung it. I know mad right? but it had to be settled, I couldn't stand the thought I had spent good money on something that wasn't right buuut I think it'll be all good fingers crossed still we should have got the smaller one. Last year Stu stayed overnight in Sydney and said he was thinking about seeing if he could maybe pick up one of these lights while he was there and bring it home with him. If you can picture this he picked the light up from the store put it in a trolley and took it on the train to the airport haha. The things he does for me as he knew I was obsessed with having this light. So here is a pic I found online, not mine but looks just like ours. This is the light being boarded onto the plane, haha he could see them loading it from where he was and I just love this pic. Safely home and looks too large for our rental. On a side note anybody who likes to stay up late and watch Private Practice might notice that in Addison's beach house she has one hanging over the dining table. Mel from Georgica Pond also had one in her gorgeous previous house, god I love that blog. I think it should fit in well with the house and I am one happy lady. I will be very nervous when it finally goes up, do you all think it's too much to insist on a mattress to go underneath whilst it goes up just in case? Yeah I know just a tad obsessive over this light. I'm in love with that light. It's going to look amazing! Loving the light - its going to look wonderful in the space!!! Hi Miss Vintage, I'm hoping it won't be too big or even too small for the space. Hi Sue, we purchased in Sydney at Caravan Interiors and it comes in a smaller size too. You can also purchase a smaller sized one at Domayne. Hope that helps. Enjoy the rest of the build, cant' wait to see it al finished. Reminds me I have to put up some pics of our house now it is almost done. Never tidy enough to photograph. Maybe when the kids go back to school. Hi Mekaela, that is so true...some things we love and others if we had our time over would have changed, looking forward to turning it into a home. Please do share more pics, I have been a regular visiter since looking for inspiration for my own kitchen and stumbled upon yours. Hi Megan, it has been a "road less travelled" let me tell you trying to turn what is essentially designed to be a modern resort style home into a weatherboard cottage type of house. We certainly failed in some areas and succeeded in others. I certainly will do a post in the next week on my flooring and internal colours as I love sharing my choices good or bad with others but to be honest I think I have made a few wrong choices. My carpet was chosen purely from a practical perspective and was from the Gold range and as I have posted one of my interior colours I chose is too dark so my suggestion there is to perhaps pick a shade lighter for your internal walls and hopeully you wont be as dissapointed as I have been. Go with your gut on your choices. Hope your build goes well for you.